Technology, Electronics, Reviews and Geek Gossip: Power over Ethernet - What is it ? Power over Ethernet or as it is most commonly referred to “PoE” is a standards based implementation of power distribution using the same wiring on a twisted pair Ethernet network. 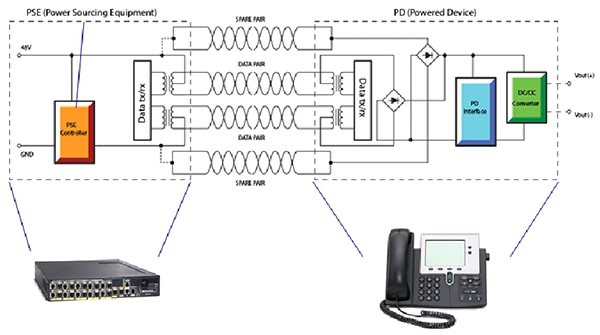 This method was introduced around the year 2000 by Cisco Systems to deliver power to their new line of VoIP (Voice over IP) phones. Basically the trick was to use the unused extra pairs on the Ethernet cable to carry DC power from the PSE to the PD. While today the most common implementation is to have the PSE integrated into the Ethernet switch, power can be “injected” in the middle of the wiring, what the standard calls Mid-Span. Over the years the standard evolved, first to 802.3at or PoE+ for up to ~25W and supporting Gigabit networks, to lately 802.3bt for up to 51-71W of power. 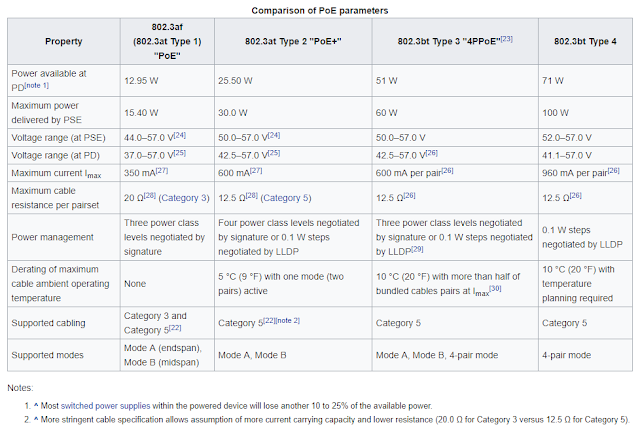 The following table from Wikipedia shows a nice table with a comparison of the different PoE parameters for each version of the standard. To optimize power usage and delivery, the standard classifies the power devices in various classes depending the amount of power they require and there is a sequencing or stages that establish how power is turned on and how much of it. IEEE 802.3 complaint implementations of PoE must follow this sort of electronic negotiation which requires a semi-smart controller on both sides of the network. 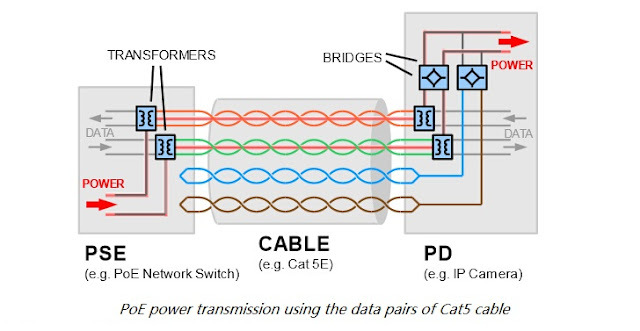 Be aware that there are non-compliant implementations of power delivery over the Ethernet cables that are improperly also called “PoE,” some of these implementations consist on just a power supply injected into the spare wires of the Ethernet cable without any negotiation/sequencing and maximum amount of power is often limited and not protected. These type of power injectors became very popular for installations of Webcams. Over the next few weeks I’ll be publishing a series of “What is on the bench” articles about different options about how to implement and embed it on your designs for Powered devices, there are various companies that make things very easy with PoE ready modules, and others that provide the key components and reference designs.